Grantham Scholar Matt Hethcoat has been presented with an award at the National Centre for Earth Observation’s Annual Science Conference. 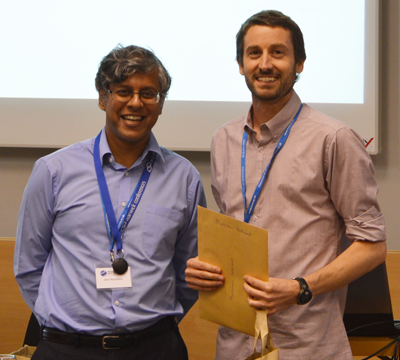 Matt, who began his Grantham Centre PhD in October last year, was given the prize for Best Oral Presentation by an Early Career Scientist at the conference in Warwick. Matt Hethcoat giving his talk at the National Centre for Earth Observation’s Annual Science Conference. Matt with Professor John Remedios, Director of the National Centre for Earth Observation. 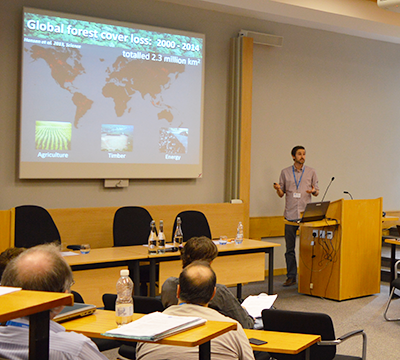 For his PhD, Matt is looking at how satellite data can be used to measure deforestation and forest degradation. Matt is jointly supervised by Professor Shaun Quegan in the School of Mathematics and Statistics at the University of Sheffield, Dr David Edwards in the Department of Animal and Plant Sciences and Dr Robert Bryant in the Department of Geography.